Large enough for all your beach essentials, the lightweigh and sturdy L*Space Sophia Tote in Black features leather handles and contrast trim detail with pom poms, made of 100% paper in one size. Handle drop is 10:, total height with handles is 27", width is 19". 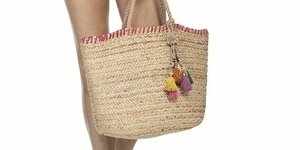 handle drop -10", total height w/handle - 27", width -19"
The L*Space Sophia Tote in Black features a leightweight, sturdy beach bag made of 100% paper with leather handles, contrast stripe detail and pom poms. Total hight with handles is 27", width is 19".